I wasn’t there when cops were busting heads in Grant Park outside the Democratic convention, or marching with antiwar protesters when W invaded Iraq, or arrested with Occupiers flooding the Financial District. But I was once right in the middle of a Chicago mob action, at Waveland & Sheffield for opening day at Wrigley Field, on Friday, April 14, 1978. To this day, it remains the largest North Side opening day paid attendance at 45,777, close to the all-time record Wrigley crowd of 46,572 on May 18, 1947 back when Jackie Robinson’s Brooklyn Dodgers first came to town. On that clear cold morning 40 years ago, I was just one of the ragged rambling mob on the streets below the center and left-field bleachers scrambling for a chance at one of the 12,000 same-day tickets for opening day (a last-minute surprise cutback from the expected allocation of 22,000), a final cosmic and dark comic gesture at working-class access to the highly anticipated annual event, courtesy of the recently late club owner Philip K. Wrigley. By the time my high school buddy Tom Williams Jr. and I arrived at the backside of the left-field bleachers, following a 3-hour dash from downstate Peoria, the ticket line in the 5:30am dawn’s early light was already hundreds, and probably thousands, deep. At that time, everyone seemed unusually sedate, settled in and camped down on the concrete sidewalk. We considered ourselves lucky that the queue starting way down the block at the Waveland and Sheffield intersection wasn’t yet to the far corner of the left-field wall near N. Seminary Street. We got in line. Bleacher seats were a buck fifty, and that’s where we intended to go. The cheap seats where all the fun happens, no matter what. The Cubs had not been winners in our lifetime, but that never mattered. Back in the day, being a Cub fan for many was something bred into a person as an integral family identity: American. Catholic. Democrat. Cubbie. It’s not something you ever stop being. You just are, no matter what. Skipping a day of class during our senior year at the now shuttered parochial Academy of Our Lady/Spalding Institute back in Peoria only added to the fun and excitement out on the big city streets of Chicago. However, after a few serene hours the romantic appeal of queuing up outside Wrigley Field on opening day ended in a terrible instant via a bizarre and awful stampede. The line in front of us literally disappeared about 7am in a headlong mad rush to the bleachers’ box office at the Waveland and Sheffield corner. “This is nuts,” Tom wearily observed as we tramped through all kinds of abandoned lawn chairs, coolers, sleeping bags, radios, shoes, food, drinks and more – everything the line campers had used to maintain their stay – that was simply left strewn across the sidewalk. I had never seen anything like it. Now, the only thing that mattered was getting inside. Any normal person would have seen the obvious dangers and immediately left the area. But not us, and the other crazies. We dove headlong into the hysterical madness. We were Cub fans. The crowd lurched forward and finally bunched up close at the corner ticket office gate where the facing brick wall sloped downwards to about a dozen feet off the pavement. People started scaling the wall in a wild attempt to bypass the locked turnstiles. With a little help from their friends, I could see a few lucky bastards actually make it over the top as others kept trying. But no one stopped much to ponder their showy efforts; the overwhelming mass of fans just kept pushing forward. In a few minutes we were in sight of the ticket office. 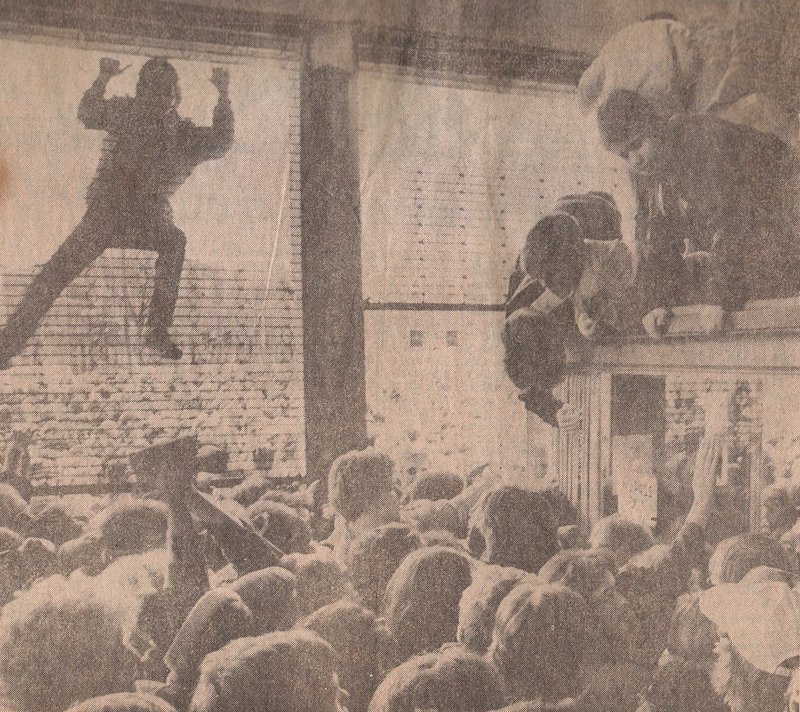 I could see guys climbing atop the turnstiles trying to muscle through to the inside. But it didn’t work, and they were just stuck up there in the oily grime taking in the chaotic view. I wasn’t afraid or fearful among the mob, only more determined than ever to stand our ground and wait around to somehow get a ticket. There were no cops, and no security in sight. Everyone continued to push and shove forward until we were piled up in front of the closed ticket office windows. There was no where else to go for our aimless mob packed in like suicidal sardines. No one was getting inside, and no one was leaving that I could see. Thankfully my good friend Tom was at least a head taller than most of the mob, so it was easy to keep each other in sight. The crowd was getting really nuts and we became separated by a dozen or more bodies. I could see he was fast losing patience with the rapidly decaying situation. “Give him room! He needs air!” someone suddenly screamed as this man started collapsing to his feet right in front of me. For a few seconds people backed off. Then he went completely down and was instantly swallowed over by mob. Gone. Out of sight. Like he never existed. It wasn’t frightening or awful or emotive in any way. He just disappeared, right there in front of me, as dozens of other saps rushed over where he had been, completely oblivious to his plight. There were still no cops, no security, no order of any kind except for the maxim of do whatever you need in order to survive. I don’t know if Tom saw what happened, but I finally caught his eye and he motioned for me to meet him back out on the street outside the crazed mob. He had had enough, and I rather reluctantly agreed. It didn’t appear that anyone was getting through those turnstiles anytime soon. “Man, do you believe that insanity? !” I said as we finally met up. Tom replied, “Let’s get out of here. We’re not getting in there again.” What really blew my mind was that a few feet out on the street there was calm and normal human behavior, as opposed to the utter life-and-death chaos back on the sidewalk in front the ticket office. The only thing that separated the two polar-opposite realities, the mayhem and the mundane, were a few flimsy blue barricades. I had never seen anything like it. We wandered around the park back toward the main entrance at Clark and Addison. Some how, some way we hung around and eventually found an open ticket window on the first-base side of the landmark “Wrigley Field, Home of Chicago Cubs” marquee. Tom and I ended up with upper-deck reserve seats way down the first-base line. We were inside the park by 11am with the absolute worst seats I’ve ever had at the Friendly Confines. On top of that, I was woefully unprepared for April in Chicago, with bone freezing cold in an unrelenting wind from the second inning on. The game? The weather made it painful to try and actually follow the two-and-a-half hours’ long proceedings, but it was, in fact, one for the ages. Cub first-baseman Larry Biittner hit a dramatic walk-off lead-off homer in the bottom of the ninth against the Pirates. I relocated to Peoria in late 2017, and saw my friend Tom a few weeks ago for the first time in decades. I asked him how he celebrated when the Cubs finally won the World Series in 2016. Tom said he had become a Yankees fan some time ago. Me, I’m ready for another great Cubs campaign in 2018. And every year after. (photo by Carl Hugare/George Quinn from the back sports page of the Chicago Tribune, April 15, 1978.